Our BLG reader Bill brought us Farley and the Lost Bone by Lynn Johnston and Beth Cruikshank, well known for the cartoon “For Better of Worse.” I think Bill was quite excited to share the talent of these cartoonists with Division 5! Poor Farley has lost his bone and can’t remember where he buried it! Well, truth be told, he can’t even remember that he lost it to begin with – he just has a longing and a nagging feeling when he sees Elly digging in her flower bed. When he realizes that he has misplaced his important bone, he digs up many corners of the yard in an attempt to find it. The family is not too happy and he gets yelled at and chased multiple times. But Farley perseveres and finally discovers his bone! The family forgives his incessant digging attempts when they realize he was just after his bone all along. A lovely story for dog lovers and for those that find remembering important things a little challenging at times :). Jacky: He should just put signs where the bone was. Then he wouldn’t have so much problems. Khai: I like it how in every illustration there is a bone! The book is colourful and funny. Carmen: In this book, all the pages have a bone. Farley even forgot where he put his bone so then Farley went to his people friends but they told him to go away. 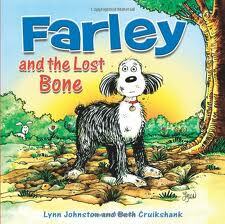 After Farley ran off, he felt soft soil and he dug and found his bone! Searching every illustration for a hidden bone is a lovely interactive feature between readers and listeners if this book is read aloud. This entry was posted in BLG Reads this week and tagged Beth Cruikshank, BLG Reads, cartoonist, favourite illustrators, fiction, great read alouds, Lynn Johnston, picture books by carriegelson. Bookmark the permalink.